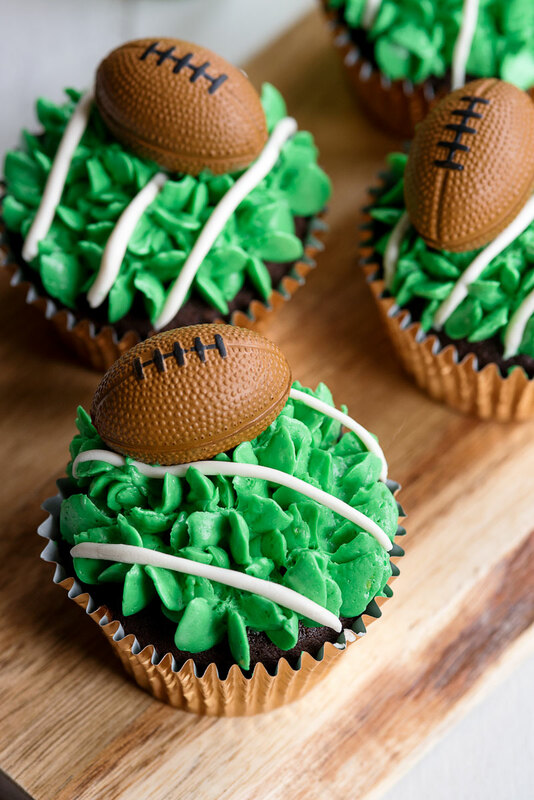 You’ll love these amazing Superbowl football cupcakes topped with mini footballs and edible grass frosting. 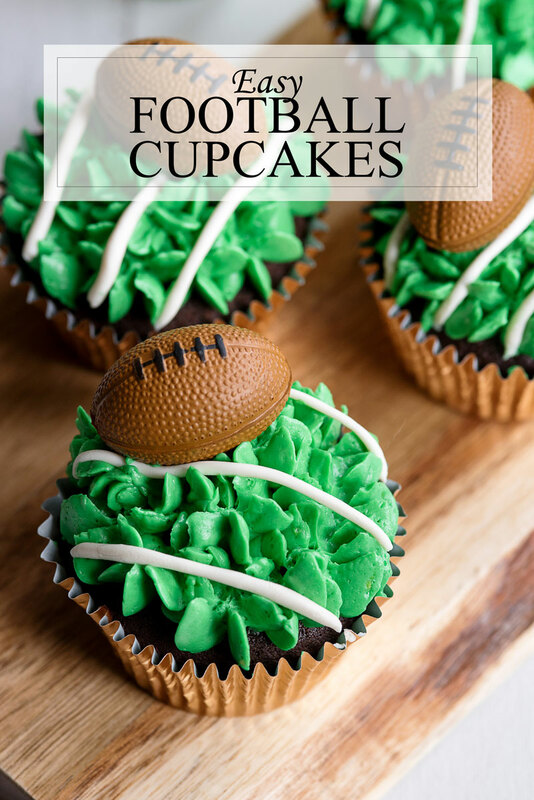 Easy to make, can be made ahead and they are sure to be a hit at your tailgating party! The Super Bowl is nearly here! Whether you’re watching for the touchdowns or tuning in for the commercials (or watching the puppy bowl? 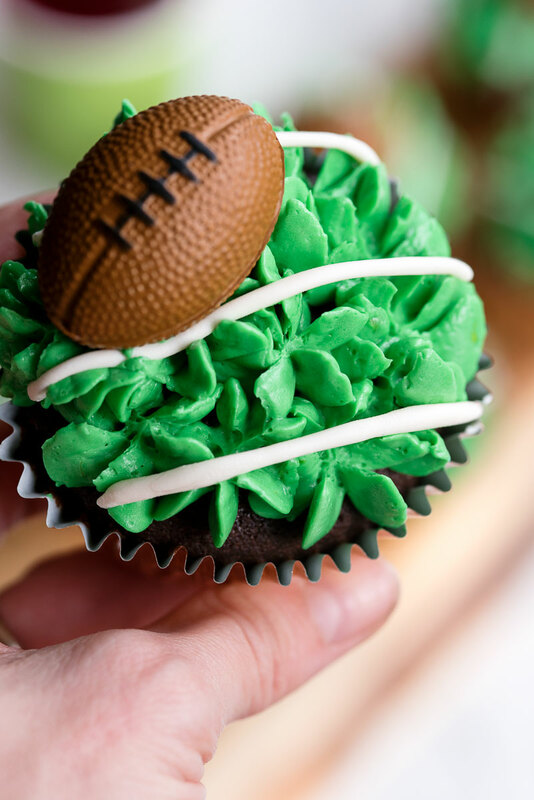 ), I have a football cupcake recipe that I know you’ll love! Not only are they amazingly delicious, they are also fun to make and to eat. I’m always looking for fun party recipes that maximize crowd appeal with minimal effort required. 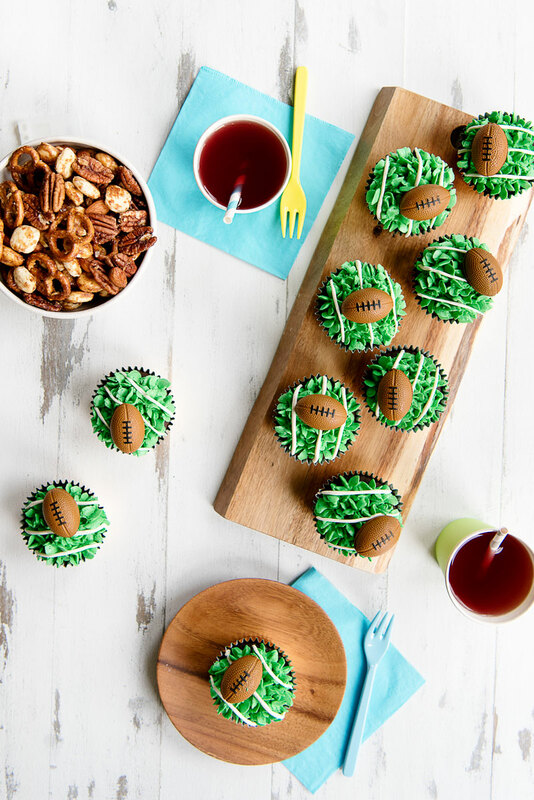 If you’re looking for a fun tailgating recipe, these football cupcakes are perfect! Like all of my favorite party recipes, they can be made ahead of time. 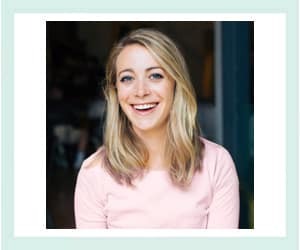 I’ve included instructions in the ‘notes’ section of the recipe if you want to skip the hassle on the day of your party. I tried a couple of different frosting tips to get the grass effect on the cupcakes. The obvious choice was the ‘grass tip‘. It looked ok, but it was really tedious work and looked a little too messy for my taste. I wanted something that was easy to do, took less than a minute per cupcake and had a more ‘cartoonish’ grass effect. Then I tried a closed star tip. It was super easy to get the effect you see on the cupcakes. It didn’t take a lot of precision and I could decorate the cupcakes really quickly. This is easily something you can do even if you have only basic piping skills. It’s very forgiving and great if you’re as impatient as I am! 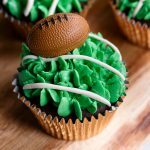 Amazing Superbowl football cupcakes topped with mini footballs and edible grass frosting. 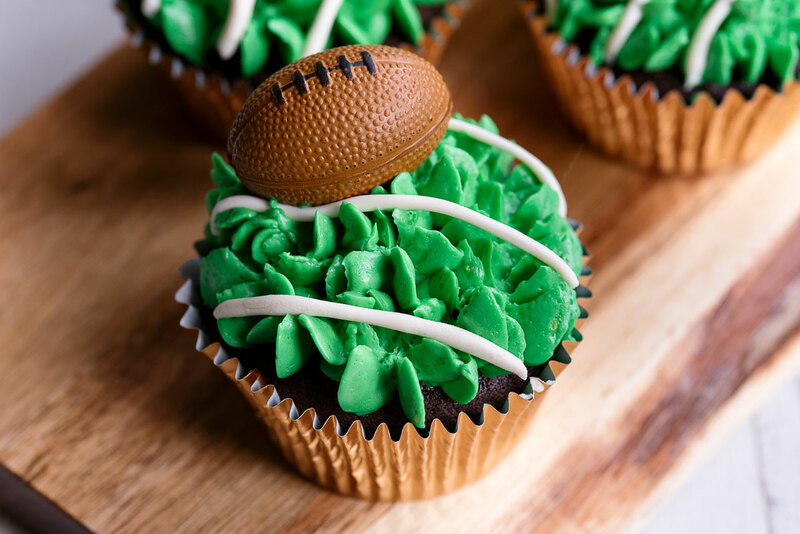 Easy to make, can be made ahead and they are sure to be a hit at your tailgating party! Make chocolate cupcakes according to recipe instructions and let cool completely before frosting. Bring a medium pot filled with one inch of simmering water to a boil. Place the egg whites and sugar in a stainless-steel bowl (like a stand mixer bowl). Use a whisk to beat the mixture until very hot (about 160° Fahrenheit). Remove from heat and mix with the whisk attachment on high until it is cool, thick and glossy and has tripled in volume, about 5 minutes. Reduce speed to medium and add butter a few pieces at a time. Set aside 1 cup of frosting for piping lines. Mix in green food gel coloring a tiny bit at a time until to desired color is achieved. Fit a piping bag with closed star piping tip and fill with green frosting. Holding tip perpendicular to cupcake surface, pipe “grass” by pressing out frosting and lifting straight up. Repeat until entire cupcake surface is covered. Fit a second piping bag with the open hole piping tip and fill with the remaining uncolored buttercream and pipe three white lines on each (to represent field lines). 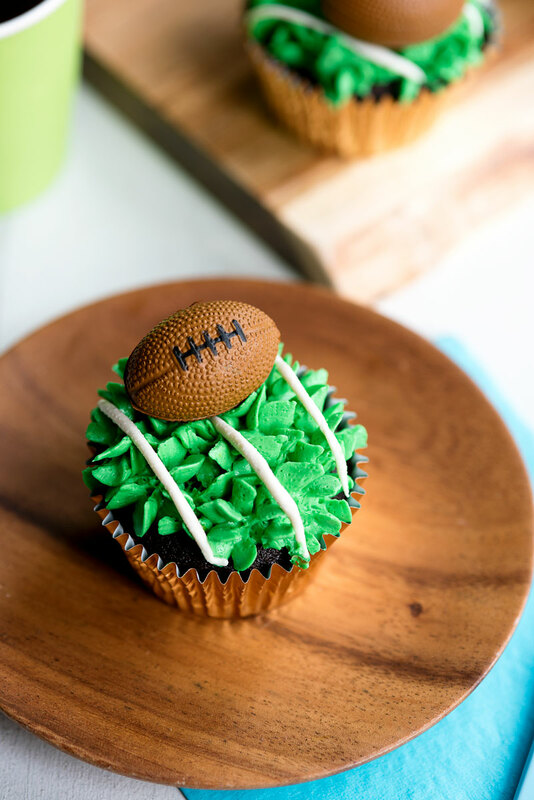 Press a mini football onto the frosting. Notes on Making & Troubleshooting Buttercream Frosting: If the frosting is too soft and doesn’t seem to be coming together, it’s possible that it’s too warm. You could try popping it into the fridge for 10-15 minutes and then re-mixing with the paddle attachment in your electric mixer until it comes together and is smooth and satiny. In general it’s hard to over-whip buttercream, so I would err on the side of mixing it longer to see if you can salvage it, even as long as 15 minutes! Notes on Making Cupcakes Ahead: The cupcakes can be made up to a week in advance and will keep in the fridge. The frosting should be made when you are ready to frost the cupcakes, but the cupcakes can be frosted up to two days in advance and kept stored in the fridge in an airtight containers. These cupcakes actually manage to look cute, lol. They do look delicious too!